Next month, Vertebrae will be able to distribute web-based AR ads to mobile browsers, just in time for the iOS 11 launch that brings with it ARKit. Vertebrae's launch partners will debut the experience through Android Chrome browsers prior to the iOS 11 release, then targeting devices running iOS 11 upon its availability. The company will offer a native SDK and a Unity-based SDK to build ad units. Vertebrae started by building VR ad units and formats natively, including product placement in virtual environments and 360 video, served to VR headsets. Last year, they began expanding their support to 360 video, web, and mobile last summer. Four months ago, around the time of Facebook's announcement of their AR platform at their F8 developer's conference and the deployment of Snapchat's World Lens feature, the company realized how important AR was going to be. "I think the aha moment really came when we saw the accessibility of AR in the short-term. You don't have to go through the same effort of creating a 360 video to create a short and engaging AR experience," said Vince Cacace, founder and CEO of Vertebrae, in an interview with Next Reality. The web-based ad formats will offer facial detection and horizontal surface tracking to enable simpler AR experiences. For example, users will be able to visualize a car in their mobile browser, including anchoring the virtual vehicle in their driveways, sitting in the driver seat, and customizing the color and trim. In the realm of entertainment, users will be able to photograph themselves next to movie characters. 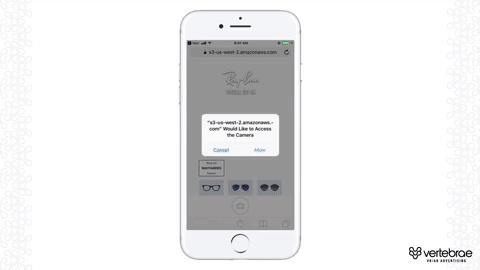 Yet another use case adapts Ray-Ban's sunglasses try-on tool to mobile browsers. "What we realized was that the right opportunity for us doesn't make sense to wait on this ARKit ecosystem to emerge of all these specific apps and trying to figure out which ones are going to be the stickiest. It was more like, how do we build a quality AR experience over the web on iOS 11?" said Cacace. In the short term, Vertebrae will continue to focus on delivering AR and 360 video across the web before approaching native apps. As platforms mature in terms of demand for advertising and availability of experienced developers, the company will continue to refine more immersive native formats inside the VR headset and eventually approach develop formats for AR headsets. You can imagine having some of the richest experiences possibly inside of a Meta 2 or a Meta 6 down the road...While we are starting with in mobile web, the same concepts and formats apply to the in-app ecosystem; you just have slightly better video SLAM and tracking and capabilities, and I can imagine that will be true moving to a headset-based model as well. Where Vertebrae believes they can succeed where others have stumbled is by delivering high-quality, engaging ad experiences without the "pain points" of downloading a third-party app or even a brand's own app. "It's hard to lead a consumer to a specific destination to have an AR experience," said Cacace. "The differentiation is really being able to deliver high-quality, engaging experience over the web in as frictionless a way as possible, where the only point of friction is allowing camera access." Vertebrae works with brands and advertisers as well as publishers. Current customers are concentrated mainly in entertainment and sports, including Disney, Lion's Gate, and the NBA's Dallas Mavericks, with advertising agencies such as Edelman, restaurant brands like Taco Bell, and biotech and pharmaceutical clients like AmGen also in the mix.